THE SOLUTION FOR DETANGLING AND CONDITIONING™ is an extraordinarily versatile product which will help detangle the most difficult mats and/or condition a wide range of coat types. Extreme concentration creates great value. May be highly diluted for leave-in detangling spray or used straight to help loosen tough mats. Humectant and emollient rich formula is gentle and may be used regularly for beautiful show ring results. Great for groomer’s/bather’s hands. Excellent for use on dogs, cats, horses, rabbits, llamas and all companion and farm animals. Versatile, Makes Up To 41 Gallons Of Spray-On Product. 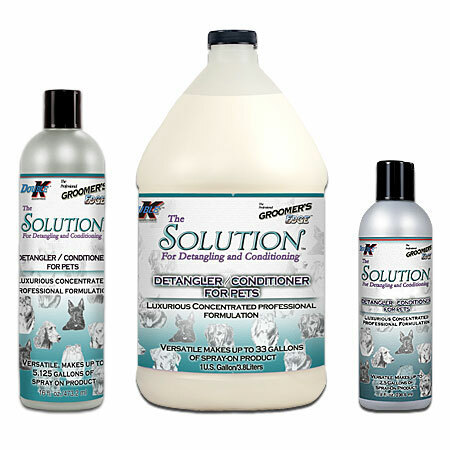 THE SOLUTION FOR DETANGLING AND CONDITIONING� is a high quality, highly effective product for grooming and is shipped in a concentrated formula that may be diluted at a ratio of up to 40 parts water to 1 part solution.The most effective way to dilute The Solution is to add it to a container that already contains water, and is only 2/3 full. This will provide an excellent environment to ensure that as the product is shaken or mixed it will dilute sufficiently. Severely Matted Hair or Fur: Apply concentrated product directly onto severely matted hair or fur and massage in using fingers to separate the mat. Leave in one to two minutes and gently brush or comb out. Rinse well. Lightly or Moderately Matted Hair or Fur: Dilute product in as little as four parts and up to 15 parts warm water and pour or spray on animal (as consistency warrants). Gently comb or brush out and rinse well. Leave‑in Spray For Conditioning and Detangling: Dilute approximately 28 to 1. No need to rinse. Leave‑in Finishing Spray for Static Control and Shine: Dilute approximately 40 to 1. No need to rinse.